The Daramalan Theatre Company was formed in 1998 to give a professional structure to the theatrical performances presented by Daramalan College students and staff. It acknowledges Daramalan’s very fine prior record in the Performing Arts while developing a formal rationale for the development and presentation of theatre. The Company explores theatrical processes and subject matter of particular relevance for younger people, the Daramalan community and the wider society. Its program varies from group devised productions, classic and contemporary scripts, in-house scripted works and musicals. Each production is given a fresh treatment that will be of benefit to the participants and audiences. 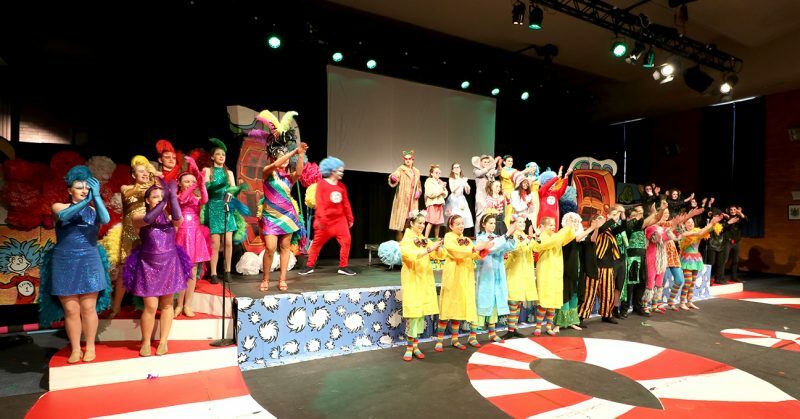 The range of productions is illustrated by the devised joint production of “Installation Ark” presented with the Visual Arts Department (2013), Disney’s The Little Mermaid Jr (2014), Shakespeare’s The Taming Of The Shrew (2014), CLONE (2015), Ishmael and the Return of the Dugongs (2016) , Hamlet and The Lion the Witch and the Wardrobe in 2017 and Suessical Jr in 2018. The chosen themes are often spiritual in nature while acknowledging the contemporary reality of contemporary experience: ennui, rampant materialism, the abandonment of spiritual values, the reduction of life and existence to commodities, the havoc caused by drugs and addictions, the growing violence between competing belief systems. Focusing on these issues gives greater leverage and support to curricula and pastoral care programs offered within the school. It also gives the wider community a focus for artistic relevance for everyday existence. For detailed policy, history and related materials click on this link (PDF).